It has been well documented how following a week long barrage of the opposing German lines, fourteen British divisions on an eighteen mile front rose from their trenches at 7-30 am on July 1st 1916. Bugles sounded and whistles blew as men scrambled out of their positions to "walk through the decimated enemy lines". As we know now, this was not to be the case as the deeply entrenched enemy emerged from their dugouts as the sun was burning through the morning mist to wreak havoc amongst the advancing troops. The end of that fateful day saw close to 60,000 casualties on the British side, 19,000 of whom died on the chalky fields of the Somme. Over twenty men were dying for every minute of that summer's day in Picardy. Amidst the tales of death, carnage and wholesale slaughter, stories of great bravery, devotion to duty, care for their fellow men and indeed self-sacrifice were also to emerge. Many awards and decorations were bestowed on brave young men that day, but nine of them would be singled out for the ultimate accolade for outstanding deeds of gallantry in the presence of the enemy, the Victoria Cross. Only three of these nine gallant men survived the carnage of July 1st to be presented with their medals in person. The other six gave their lives and still lie out on the Somme battlefield. This is my attempt to briefly tell the stories of these incredibly brave and selfless men. Private William Frederick McFadzean - 14th Battalion Royal Irish Rifles. Temporary Lieutenant Geoffrey St George Shillington Cather - 9th Battalion Royal Irish Fusiliers. Rifleman Robert Quigg - 12th Battalion Royal Irish Rifles. Temporary Captain Eric Norman Frankland Bell - 9th Battalion Royal Inniskilling Fusiliers. Captain John Leslie Green - Royal Army Medical Corps attached to 1/5th Battalion the Sherwood Foresters. Major Stewart Walter Loudoun-Shand - 10th Battalion the Yorkshire Regiment. Drummer Walter Potter Ritchie - 2nd Battalion Seaforth Highlanders. Corporal George Sanders - 1/7th Battalion West Yorkshire Regiment. Sergeant James Youll Turnbull - 17th Battalion Highland Light Infantry. It can be seen that four of the men all served with Irish regiments and all served under the banner of the 36th Ulster Division under the command of Major General O.S.W. Nugent. This division was formed after negotiations between Lord Kitchener and Sir Edward Carson of the Ulster Volunteer Force. The order for its formation was issued on October 28th 1914, the red hand of Ulster being chosen as the divisional badge. On the night of June 30th 1916, the ten battalions of the Ulster Division assembled in the Thiepval wood area and in a nearby sunken road. Legend has it that as zero hour approached, Orange order members donned their sashes and as they went "over the top" advancing toward the German lines the cry was of "no surrender", the battle cry of the Derry Apprentice Boys as July 1st was also the anniversary of the Battle of the Boyne. Captain Bell was with the 9th Battalion Royal Inniskilling Fusiliers and was attached to the 109th Trench Mortar Battery. They were on the right of the assault and just before 7.30 crept out into No-Man's Land, waiting for the barrage to lift. Captain Bell and his battery advanced with the infantrymen and all were in a way the victims of their own success. The advance went well, but on either side of the Ulstermen the assaulting brigades were not faring so well. This led to the 36th division creating a small salient or bulge in the line. It also meant that they were vulnerable to merciless machine gun fire from the sides as well as the front. Captain Bell's citation from the London Gazette, September 26th 1916 reads. "For most conspicuous bravery, when the front line was held up by enfilading machine gun fire, Captain Bell crept forward and shot the machine gunner. Later, on no less than three occasions when the bombing parties that were clearing the enemies trenches were unable to advance, he went forward alone and threw trench mortars among the enemy. When he had no more bombs available, he stood on the parapet under intense fire and used a rifle with great coolness and effect on the enemy advancing to counter attack. Finally he was killed rallying and reorganising infantry parties, which had lost their officers. All this was outside the scope of his normal duties with his battery. He gave his life in his supreme devotion to duty." Captain Bell was just twenty years old. His body was sadly never recovered from the battlefield so this brave young man has no known grave but is remembered with honour on the Thiepval Memorial to the Missing. Eric Bell was the son of Captain E H Bell of University Road, Bootle, Liverpool. Before the war he had worked as an assistant to a professor in the school of architecture at Liverpool University. His Victoria Cross was presented to his family on November 29th 1916, by King George V at Buckingham Palace. I believe that Eric Norman Frankland Bell's VC is still held by members of the family. Robert Quigg was born on February 28th 1885 at Ardihennon, County Antrim where his father worked as a boatman and tourist guide on the Giants Causeway. He was educated at the Giants Causeway National School where he was described as "A diligent and reliable pupil". On leaving school he held several farm labouring jobs, finally working on the estate of Sir E C McNaghten up to the time of war breaking out. Robert Quigg volunteered and was signed up for service in September 1914 as a rifleman with the 12th battalion, Royal Irish Rifles-Mid Antrim Volunteers. By coincidence his platoon officer was Harry McNaghten, son of the estate owner where Robert had worked. Despite social and class differences, the two men apparently built up a close friendship. On the morning of July 1st, the Mid-Antrim Volunteers met a fierce response from the German machine gunners as they emerged from Thiepval Wood. His platoon advanced no less than three times, being beaten back by the ferocity of the defenders on each occasion. After the assaults in which hundreds of the 12th battalion had lost their lives, word got back that Lieutenant Harry McNaghten was missing on the battlefield. Robert Quigg immediately volunteered to go out and try to find him. Over the course of seven hours he ventured out under intense machine gun and shellfire on no less than seven occasions. Each time he returned with a wounded colleague. It is said that on his last foray into no-mans land, he crawled to within yards of the German wire and dragged a badly injured man back on a groundsheet. These heroic actions earned Robert Quigg his Victoria Cross which was gazetted on September 9th 1916. Sadly Harry McNaghten was never recovered from the battlefield. On January 8th 1917 Robert Quigg travelled to Sandringham House in Norfolk to receive his decoration from King George V.
A story at the time relates that when the presentation was being made, the king commented, "You're a very brave man Quigg". To which the Ulsterman replied, "You're a brave man yourself king". Whether this is true or not is, I think, open to debate. On his return to his hometown, he was afforded a hero's welcome by his fellow citizens. The McNaghten family were foremost in this with Lady McNaghten presenting him with a gold watch in recognition of his bravery and selflessness in trying to find her son. He saw out the war and remained in the army, finally retiring in 1926 after an accident in Belfast. In 1929 Robert attended the VC reunion dinner held in the Royal Gallery at the House of Lords. There was to be one more encounter with the monarchy when in 1953 Robert Quigg was presented to the newly crowned Queen Elizabeth 11. Robert Quigg VC died on May 14th 1955 aged 70 in Ballycastle, County Antrim. He was buried with full military honours in Billy parish churchyard. His Victoria Cross and Medal of the order of St George 4th class, which was presented to him by Russia are held at the Royal Irish Rifles museum in Waring St Belfast. Geoffrey Cather was born on October 11th 1890 at Streatham Hill south west London. He was the son of the late Mr R G Cather and Mrs Cather of West Hampstead. His formative years were spent at Hazelwood School at Limpsfield in Surrey followed by higher education studies at the famous Rugby School. In September 1914, just after the outbreak of hostilities he enlisted in the University and Public Schools corps and was then commissioned into the 9th battalion Royal Irish Fusiliers in May 1915, the battalion landing at Boulogne in October of 1915. On the eve of the Somme battle, the 9th battalion were in their jumping-off positions just north of the river Ancre on a four platoon front. They moved off just before 7.30 am to cross six hundred yards of No-Mans Land towards their objective of Beaucourt Station. Once more, high casualties resulted as the withering German machine gun fire tore into the advancing Ulstermen. It was reported that a few men did make it through to Beaucourt but the battalion was eventually withdrawn to their start positions due to the casualty toll. At roll-call at the end of the day of over six hundred men who had started off, just over five hundred were either killed, missing or wounded! Later in the day the remnants of the battalion were withdrawn to the village of Hamel. Search parties were organised that evening to go back over no-mans land to look for their missing comrades. Lieut Cather as battalion adjutant led one of the parties. From 7.00 pm until midnight he searched the area under constant machine gun and artillery fire, bringing in three wounded men. The next morning he resumed his search and brought in another injured comrade and carried water to others arranging for them to be collected later. At 10.30 am he took water out again to the wounded and was moving amongst them when he was killed himself. Geoffrey Cather was twenty six years old. His body, like so many others was sadly never recovered from the battlefield and his name is remembered with honour on the Thiepval Memorial to the Missing along with 72,000 other gallant men who shared the same fate on the Somme battlefields. His Victoria Cross citation was gazetted on September 9th 1916 and presented to his family by King George at Buckingham Palace on March 31st 1917. His award today is held by the Royal Irish Fusiliers Museum in Armagh. Billy McFadzean was born at Lurgan Co Armagh on October 9th 1895 the son of William senior and Mrs McFadzean of Rubicon, Cregagh, Belfast. He was educated at Mountpottinger Boys School and later attended the Trade Preparatory School in Belfast. Billy was described as "13 stones and six feet tall, a fine healthy young Ulsterman." He gained respect as a useful player with the Collegians Rugby Club. After school he became an apprentice in the linen business with Spence, Brysin and Co. of Belfast. He was also an enthusiastic member of the Ulster Volunteer Force, 1st battalion Ballynafeigh and Newtownbreda East Belfast Regiment. He joined up for war service on September 22nd 1914 as a private with the 14th Battalion Royal Irish Rifles. They trained at Bundoran and Randalstown before moving across to England in the summer of 1915. The battalion landed at Boulogne in October of that year. The night of June 30th 1916 found the battalion in their assembly trenches at Elgin Avenue in Thiepval Wood. It was here in the trench, in darkness, before the morning attack that Billy McFadzean would sacrifice his life and be posthumously awarded the Victoria Cross. The battalion war diary records, "heavy bombardment, great trouble in keeping the candle alight," In the trench Billy was singing his favourite song "My little Grey Home in the West" and keeping his comrades spirits up with his jokes and banter. The trench was about seven feet deep and boxes of Mills bombs were being distributed prior to the attack. As Billy lifted a box, it overturned, spilling the bombs onto the floor of the trench and dislodging the pins in two of them. Knowing full well what would happen, Billy threw himself flat onto the bombs just as two of them exploded. Billy lost his life instantly however this heroic act saved the lives of dozens of others and incredibly only one other man was injured. William McFadzean's Victoria Cross was gazetted on September 9th 1916 and once again his name is remembered on the Thiepval Memorial for all those with no known grave. His commanding officer Lieut Col F C Bowen wrote to Billy's father on September 16th. It was one of the finest deeds of a war that is so full of big things and I can assure you that the whole battalion rejoiced when they heard it. Your gallant boy, though gone from us, his deeds will forever live in our memories and the record will go down for all time in the regimental history which he has added fresh and great lustre to." The family also received a letter from Buckingham Palace on December 18th 1916. "It is a matter of sincere regret to me that the death of Private McFadzean deprived me of the pride of personally conferring upon him the Victoria Cross, the greatest of all rewards for valour and devotion to duty." William McFadzean's VC was the first to be won on that July day in 1916. Billy's father was given a third class rail ticket with which to travel to London on February 28th 1917 where his sons Victoria Cross was presented to him by the king at Buckingham Palace. "Nothing finer has been done in this war for which I have given a Victoria Cross than the act committed by your son to save many lives in giving his own so heroically." Billy McFadzean's name still lives on today in a song that is still sung in Ulster and a wall mural in East Belfast has as part of its design a copy of the telegram that was sent to his parents informing them that he had been killed in action. His VC today can be seen at the Royal Ulster Rifles Museum in Belfast. Today, set in the Somme battlefield can be found the memorial to the 36th (Ulster) Division. Known as the Ulster Tower it is a replica of Helen,s Tower from the Clandeboyne estate in County Down where the division trained prior to leaving for France. As you enter the gate to the tower, just on the left is a memorial stone erected by the Royal Irish Rangers and unveiled by the Duke of Kent on July 1st 1991, the seventy fifth anniversary of the battle. The names of the Ulster Division VC winners are all recorded here including Eric Bell, Robert Quigg, Geoffrey Cather and William McFadzean. John Green was born at Buckden in Huntingdonshire in December 1889, the son of John George and Florence May Green. He was taught through his early years at Felstead School and then studied medicine at Downing College Cambridge and St Bartholomew's hospital. He was a keen all-round sportsman, excelling at rowing, golf and tennis and was described as always very popular at school and college. At the outbreak of war he had not quite completed his medical studies but was however commissioned into the Royal Army Medical Corps. His first appointment was to the 5th Battalion South Staffordshire Regiment and then on to a field ambulance unit. His travels finally took him to the 1/5th Battalion The Sherwood Foresters who arrived in France in February 1915 and fought at the Battle of Loos at the end of that year. On January 1st 1916 John Green married Miss E M Moss of Stainford Hall Lincolnshire. On the evening of June 30th 1916, the Sherwood Foresters were positioned in their jumping off trenches opposite Gommecourt. They were on the extreme left of the British line and at its northernmost tip. Their attack the following morning was mainly designed to be diversionary to make the Germans believe that this sector was to be the main thrust of the British attack. They advanced that morning on a line to the north of the village of Gommecourt, leaving the trenches at 7.30. The leading waves suffered heavy casualties as they were swept by machine gun fire. Captain Green was advancing towards the rear of his battalion as they struggled to reach the German wire. When John Green did reach the entanglements he found a badly wounded officer caught in the wire and suffering greatly. He managed to free the man and dragged him to a nearby shell-hole where he dressed his wounds. With this done and despite being under almost constant bomb and rifle fire, Captain Green started back across over two hundred yards of No-Mans Land in an attempt to get his wounded colleague to safety. They had almost made it when the wounded man was hit again. They stopped and John Green started to tend to the man again when he himself was hit and killed instantly. Captain John Green was twenty six years old. His fellow officer did manage to reach the British line but sadly he also died later in hospital. Captain Green's Victoria Cross was gazetted on August 5th 1916 and presented to his wife by King George V at Buckingham Palace on the 7th of October 1916. His body was recovered from the battlefield and lies today in Foncquevillers Military Cemetery. There is a commemorative stone in the village of Buckden to Captain Green and his brother, 2nd Lieut Alan Edward Green who was killed at the Battle of Loos. The stone was erected by their father. Captain John Leslie Green's Victoria Cross can be seen today at the Army Medical Services Museum in Aldershot. Walter Ritchie was born in March 1892 at Hopehill Road in Glasgow, the son of Walter and Helen Monteith Ritchie. A religious boy, he was a keen member of the Episcopal Church in Troon, Glasgow. After his schooling he started an apprenticeship as a blacksmith. This wasn't to last very long however and even though he was underage he decided to join the army. He enlisted as a drummer in the 8th Battalion, Royal Scottish Rifles and then transferred to the 2nd Battalion The Seaforth Highlanders in 1908 although still only sixteen years of age. At the outbreak of war Walter's battalion were one of the first to land on French soil in August of 1914. They saw action on the retreat from Mons at the Battle of Le Cateau and were also involved at the Battle of the Marne and the fighting in the Ypres salient in 1915. 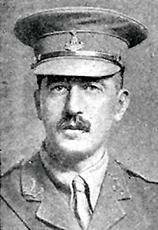 On the eve of the Somme offensive, Walter and the 2nd Seaforths were positioned in reserve trenches as they were not to go forward in the first wave of the attack. Just after 7.30 that morning the Hampshire and East Lancs regiments moved off for the attack up to the Redan Ridge. At 9.00 it was the turn of the 2nd Seaforths and as they pushed forward the war diary records "heavy machine gun fire from the ridge and the direction of Beaumont Hamel." They managed to reach the third line of German trenches, but by now numbers had been decimated and men cut down in swathes. Walter Ritchie then decided on his own initiative to climb onto the parapet of the enemy trench where despite being under machine gun and bomb attacks he repeatedly played "The Charge". This helped to rally the melee of men of many units who were by now wavering and starting to retire as most of them had lost their units and commanders. "This action showed the highest type of courage and personal initiative." Throughout that long July day Walter continued to show the greatest devotion to duty carrying messages back and forth over the fire swept battlefield. As a result of his actions on that day Walter Potter Ritchie was awarded the Victoria Cross, which was presented to him personally by the King at Buckingham Palace on November 25th 1916. Walter was one of the lucky ones to survive the Great War despite being gassed twice and wounded on two other separate occasions. He was also honoured by a grateful French nation being awarded the Croix de Guerre. In 1920 Walter attended a garden party given by a grateful King George V at Buckingham Palace and on November 11th of that year proudly stood as one of the "V C Guard" at the interrment of the unknown warrior in Westminster Abbey. In November 1929 a reunion dinner for VC holders was held at the House of Lords, which Walter attended. His final encounter with royalty came in June 1956 when to commemorate 100 years of the Victoria Cross Her Majesty Queen Elizabeth 11 held a centenary review of VC holders at Hyde Park in London. Walter Potter Ritchie died on March 17th 1965 in Edinburgh aged 73. His funeral service was held at Warriston Crematorium in the city. Unlike so many VC winners, Walter Ritchie's award is not held by the family or a regimental museum but has passed into private hands after being sold at auction. Born on July 8th 1894 at New Wortley near Leeds, George Sanders was the son of Thomas and Amy Sanders. He was educated at Little Holbeck School and after completing his time there was indentured as an apprentice fitter at the nearby Airedale Foundry. George enlisted for service on November 9th 1914 and was drafted to the 1/7th Battalion, The Prince of Wales Own Yorkshire Regiment-Leeds Rifles. After spells of training at York and Gainsborough the battalion sailed for France and landed at Boulogne in April of 1915. The battalion spent the night of June 30th 1916 in support trenches in Aveluy Wood, across the river Ancre and directly behind the Ulster division who were massed in Thiepval Wood. As documented earlier, the Ulstermen went over in the first wave and George Sanders with the West Yorks were ordered forward to support at 9.00 on July 1st. They moved forward to trenches at Belfast City in Thiepval Wood and were then pushed into the battle in support of the Ulster division against the formidable German strongpoint of the Schwaben Redoubt. Amidst the confused scenes on the battlefield the West Yorks were withdrawn late in the day but George Sanders with around thirty men was left behind isolated after an assault on a section of the German line. He immediately set about organising their defence and bombing parties, all the while impressing on the men that his and their duty was to hold the position at all costs. They continued to hold the position through the night and on the morning of the 2nd July drove off a German attack and managed to rescue some prisoners the enemy had captured. Throughout the second day they fought off a further two counter attacks and spent a second night in their isolated position. They were finally relieved early on the morning of the third day. George Sanders showed great courage, determination and leadership during their ordeal, finally returning to the British lines with nineteen men of his party. They had been without food or water throughout, giving what they did have to the wounded on the first night in isolation. 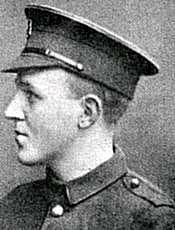 Corporal George Sanders, was invested with his Victoria Cross, by the King, at Buckingham Palace on November 18th 1916. On June 27th 1917 George was awarded a commission with the 2nd Battalion of the West Yorkshire Regiment. In April of 1918 the West Yorks were involved in bitter fighting at Mount Kemmel during the German Spring Offensive. Acting Captain Sanders was awarded the Military Cross to go with his VC during this action and was then taken prisoner of war on April 25th. He was posted as wounded and missing having been last seen with leg and right arm injuries but carrying on with his revolver in his left hand. In July of 1918 his father received a letter from George confirming that he was being held prisoner at a camp in Limburg. George Sanders was repatriated on Boxing Day 1918 and demobbed in March of 1919. June 1920 saw his attendance at the Buckingham Palace garden party given by the king and he also attended the VC reunion dinner in November 1929. George Sanders MC VC died in Leeds on April 4th 1950 aged 56. His funeral was held at the Cottingley Crematorium in the city. It is believed that George,s son Kenneth Sanders still lives in Leeds and retains his fathers Military Cross and Victoria Cross. James Turnbull was born in Glasgow in 1884, the son of James and Elizabeth Turnbull. A keen sportsman, he played rugby for the Cartha Queens Park club in Glasgow. James enlisted for service with the 17th Battalion The Highland Light Infantry - Glasgow Commercials. They did their training in North Yorkshire and at Codford, landing at Boulogne in November of 1915. The night of 30th June 1916 saw the battalion in assembly trenches opposite the German strongpoint known as the Liepzig Redoubt, their objective the following morning. The war diary records that the leading companies crept forward a few minutes before 7.30 and got to within thirty to forty yards of the German wire whilst the British artillery barrage was still under way. When the barrage lifted Sergeant Turnbull and his men rushed forward to take advantage of gaps in the German wire. The troops on their flanks were not so successful and the Highlanders were exposed to fierce enfilade fire from both sides. To counter this they established bombing posts in prominent positions to try and protect themselves. It was one of these posts that James Turnbull and his men found themselves holding against prolonged German attacks throughout the day. His men were wiped out on more than one occasion and reinforcements had to be rushed up to bolster the position. James Turnbull however showed most conspicuous bravery and devotion to duty and never wavered in his determination to hold his position. Almost single-handedly at times he held the post showing the highest degree of valour and skill. 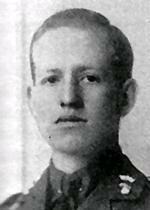 Sadly later in the day James Turnbull lost his life whilst gallantly bombing a German counter-attack from the parados of the trench, he was thirty two years old. His Victoria Cross was gazetted on November 25th 1916 and at a ceremony at Buckingham Palace on May 2nd 1917, his VC was presented to his father and sister by King George V.
James Youll Turnbull is buried in Lonsdale Cemetery at Authuile on the Somme battlefield, not far from where he performed those gallant deeds on July 1st 1916. He is also remembered at his old rugby club, Cartha Queens Park in Glasgow where his name will be found on the club war memorial, which was unveiled in 1923. I believe that James Turnbull's Victoria Cross is still held by family members. This gentleman was born in Ceylon ( Sri Lanka ) on October 8th 1879, the second son of Mr & Mrs John Loudoun-Shand who ran a tea plantation on the island. They had ten children, five boys and five girls. Incredibly all five Loudoun-Shand boys served in the Great War. The family had returned to England and lived at Dulwich in London. Stewart and his brothers all completed their education at Dulwich College. An all-round sportsman at school, Stewart excelled at cricket, golf and swimming. After completing his schooling he started work as a clerk with Williams Deacons bank and in his spare time served with the London Scottish. On the outbreak of the South African war he sought service with the London Scottish but was excluded because of his youth. This did not stop him however and he managed to enlist with the Pembrokeshire Yeomanry and served right through the war. When hostilities ceased he was offered a mercantile appointment in Port Elizabeth where he stayed for three years building up his business experience. In 1904 he returned to Ceylon, working as a tea merchant, a post his father had secured for him through his contacts in the trade. When war broke out in 1914, Stewart Loudoun-Shand was on one of the first available sailings home to volunteer his services. He gained a commission with the 10th Battalion Alexandra Princess of Wales's Yorkshire Regiment - Green Howards, at thirty five years of age. He was promoted to Captain in June 1915 and the battalion landed in France in early September of that year. They were put to the test very soon after landing, fighting at the Battle of Loos in late September 1915. The 10th battalion suffered very high officer casualties at Loos and as a result of this Stewart was given the rank of Temporary Major. June 30th 1916 had the 10th Yorkshires in trenches opposite Fricourt where they were to be in support of the main attack following up behind the 4th Middlesex. When the time came to go Major Loudoun-Shand,s "B" company were in severe difficulty as they tried to clear the trench due to the murderous machine gun fire raining down on them. The major didn't hesitate and leaping onto the parapet of their trench under constant fire helped and encouraged his men "over the top". As the blizzard of fire that they were enduring continued, Major Loudoun-Shand was badly wounded but even then insisted on being propped up to continue his encouragement to the men, remaining like this as his life gradually ebbed away. His company had gone into action with five officers and one hundred and seventeen men, they returned with just one officer and twenty seven men. For his actions on that day Major Loudoun-Shand was awarded a posthumous Victoria Cross. He is buried in Norfolk Cemetery, Becordel-Becourt on the old battlefield. His Victoria Cross was gazetted on September 9th 1916 and his father travelled to Buckingham Palace on March 31st 1917 to receive his son's award from the King. Stewart Walter Loudoun-Shand's Victoria Cross has remained with his family ever since but was loaned to the Green Howards museum in Richmond North Yorks a couple of years ago when for the first time the regiment had all of their VC's together in one exhibition. In brief then, these have been the stories of the nine first day Victoria Cross winners of the Battle of the Somme. I think that anyone who reads of their deeds that day will agree that they were a unique band of fearless, dedicated and special men.